As a fan of writer/director Andrew Niccol's work, I'm happy to see him back on track with Good Kill after the schlocky In Time and the dismal Stephenie Meyer adaptation The Host. Working with a smaller budget and obviously more control over his film's handle on the intellectually and politically challenging material, Niccol finds a timely issue to dive into, one that utilizes many of the themes that he tackled in the past. The story about a drone pilot's inner struggle as he's asked to eradicate multiple innocent lives from his cushy cubicle thousands of miles away is a perfect synergy of the issue of human nature being unable to keep up with rapidly advancing technology (Gattaca), as well as the cost of blind and bloodthirsty violence on the human soul (Lord of War). 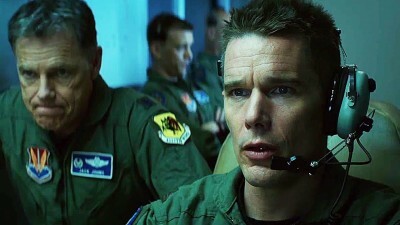 Major Thomas (Ethan Hawke. Easy on the David Bowie jokes please) is a loyal drone pilot taking out Taliban bad guys in Afghanistan from his base close to Las Vegas, 7000 miles away from where the action is taking place. Thomas wholeheartedly believes in his mission, and grins with pride as his superior (Bruce Greenwood) gives a stern speech to newcomers, "This isn't like playing X-Box. You're killing real people out there." The speech makes Thomas and the other soldiers feel better about the drone program while giving them a sense of responsibility by drilling the gravity of the drones' actions into everyone's minds. But no matter how many speeches are given about the real-life consequences of drone strikes, is it possible to not dehumanize people at least a little bit when you only see them as tiny inconsequential blips on a monitor? At first, Thomas' only gripe with the program comes from being unable to fly in a plane and go on manned missions. Even though being able to pilot a weapon thousands of miles away from conflict provides him with safety, not to mention the comfort of going back to his wife (January Jones) and children at the end of each day, Thomas can't help but feel like a coward. After all, he's a pilot, that's in his nature, and this new technology is holding him back from reaching his true potential, even if that potential involves spending long stretches of time away from his family and possibly being shut down and killed. After thousands of years of soldiers taking pride from putting their lives at risk in the name of (Insert cause here), is the quintessential soldier psyche ready to be saddled with battle that doesn't involve even the tiniest risk of physical sacrifice? Thomas' issues with inadequacy is replaced with a much more substantial moral problem when the CIA takes over the drone operations and begin ordering Thomas and his crew to willingly kill innocent civilians. The CIA's justification for the killings of innocent people, most of them women and children, is that getting the intended target is worth the lives of the collateral damage. The mysterious voice on the other end of the phone, known only as Langley, assures the drone team that the CIA has done extensive research into each mission and calculated the amount of possible innocents killed in Afghanistan against the amount of possible American lives to be lost if the target remains free. Yet for some reason, being forced to watch children being blown to pieces while being asked to look at them as nothing but meaningless statistics doesn't sit well with Thomas and his crew. Thomas' new co-pilot Vera (Zoe Kravitz) especially has a hard time carrying the moral weight of his actions, accusing the administration of doing nothing but promoting an endless cycle of violence. Thomas, on the other hand, chooses a more inward approach, as he becomes an alcoholic and distances himself from his family. I understand that in real life, it's highly unlikely that Greenwood's character would openly protest against CIA's direct orders, or Vera would claim that the drone program is only good for training terrorists without suffering some repercussions. That's why I think it's better to approach Good Kill as a morality play, which is usually seen as a negative trait. However, a well-executed morality play, one that deals with important and contemporary issues in an intelligent and insightful way should always be welcome, and it's hard to find an issue more important these days than the validity and the human cost of the drone program. I especially loved that Niccol never lets the audience leave Thomas' surroundings, allowing us to empathize with the rising paranoia and isolation of the character. We never see who's on the other end of the line during the CIA missions, and the only images we get of the battle in Afghanistan is through Thomas' monitors. This approach also sells the possible dehumanizing effects of the drone program. Taking place entirely in the outskirts of Vegas, Good Kill predictably has a very dry and earthly look, full of browns and grays. The 1080p transfer perfectly captures the film's feeling of isolation. Although Good Kill is essentially a war film, it's devoid of any actual battle scenes that could give way to a boisterous DTS-HD 5.1 transfer. Considering the film's subject matter, the lack of flashy battle sounds is kind of the point. The dialogue heavy mix is perfectly represented in this transfer; just don't expect much in terms of surround presence. Behind the Scenes: As you can tell from the bland title, this is a very traditional 15-minute making-of featurette where the cast and crew give glowing interviews about their colleagues. Some of the film's themes are discussed briefly. Good Kill is short of ending up as a great film because of the unoriginal way Niccol deals with Thomas' domestic life problems (Not helped by January Jones' lifeless performance) and an unnecessary sub-plot involving sexual tension between Thomas and Vera (Just because your two leads are attractive, it doesn't mean they have to hook up) doesn't help. However, it's a film that humanizes an issue that too many Americans take for granted or doesn't think much about, and it deserves a shot on that merit alone.